Had to spend most of Saturday in the office, and spent most of Sunday hanging out with a friend I haven’t seen in several months, but made a point of moving forward today. Cleaned up the area where the chassis had been stowed in the side yard, and moved the chassis into my parking space in the garage. I’m suffering from something called “frozen shoulder”, which essentially means I have to be careful moving my right arm around or I get near black-out inducing pain. Keeping that in mind, I pretty much rickshaw pulled the chassis around to its current position with a rope tied to it and looped across my waist. 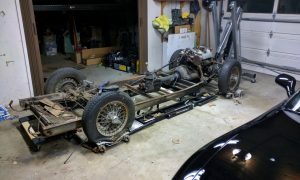 The plan is to start moving forward with pulling the chassis apart so I can make sure it’s in solid condition. Then I can get it blasted and a rust inhibiting coat put on it. Then I’ve got to start sorting out mounting the Solstice engine and transmission in there. I picked up a plasma cutter recently and chopped down the remaining framework of the Solstice, keeping only the engine cradle so I can reference that for building a new one for the Morgan. Still have the Airstream, and I need to move forward on getting that sold soon. What with my father’s injury and all of us in a consensus about not having much interest any more in using it, spending time and money on it to any further extent seems wasteful.